Having grown up in the city, it’s not very often that I’ve come into contact with so-called ‘simple folks’. That’s why, when I do come across them, whether it’s in a city or the countryside, it often turns out to be a refreshing experience. A few years ago I landed in an airport in a rural Midwest America. I stepped out and gazed at the vast expanse of never-ending cornfields and, being a city-girl, I felt as if I was stranded in the middle of nowhere. Just as I was starting to feel anxious, my shuttle pulled over to pick me up. The man who greeted me looked like he’d just stepped out of a Harley Davidson catalogue. He was a burly, middle-aged man who greeted me with an accent that was a mix of John Wayne and Garth Brooks. With his heavily muscled and tattooed arms, he lifted my weighty suitcases with ease and gently asked me where I was from. Entering his vehicle felt like entering his kingdom. Because he spent so many long hours driving around in it, you could tell he’d tried to give it a sense of home by adding personal touches. There were stickers of his favorite sports teams and a Yankee Candle car freshener. Although he looked tired after a busy week, he was chirpy. I was his last guest before he clocked out. “I can’t wait to get back to my lodge in the forest,” he said. “I’ll keep my feet up on the porch while enjoying a nice glass of chilled beer and watching the sunset. I hope I’ll see some cool animals today – perhaps a raccoon, a deer or maybe even a fox, who knows? Life is good, and I feel blessed. I find happiness no matter what’s goin’ on. Why waste time feeling anything else, right?” I nodded emphatically. I could sense the sincerity and warmth in this man’s voice as we talked during my ride to the hotel. I felt a mix of both admiration and envy for his calm repose. Sure, he wasn’t rich in the material sense, but he seemed to have a wealth of wisdom when it came to finding happiness in the small things. His philosophy reminded me of a bygone era where people believed in the power of simplicity and moderation. A time when life wasn’t defined by the drive-through kind of happiness we’re accustomed to today. Adopting simplicity certainly doesn’t imply that we should subject ourselves to a life of grinding poverty or that we give up all our material possessions and retreat to the Himalayas. Rather, simplicity is expressed in how we function. How we think, behave, live and make choices. Simplicity does not depreciate the value of life but makes it more accessible. Some of the greatest thinkers in history were passionate advocates of living the simple life. 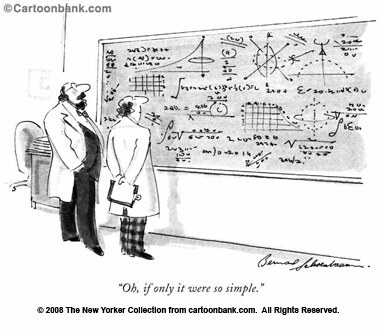 “Truth is ever to be found in the simplicity, and not in the multiplicity and confusion of things.”― Isaac Newton. “Our life is fritted away by details…simplify, simplify, simplify! ” ― Henry David Thoreau. Of course, many of these luminaries lived in eras where things were simpler by nature. Our grandparents nostalgically recall times when things were slower and more straightforward. We live in a digital age, and we’re inundated with data and external stimuli continually vying for our attention. Simplicity is no longer just a nicety but vital to our sanity and wellbeing as we try to deal with this onslaught of stimulation. We need to master the skills that will allow us to distill information to assimilate it with clarity and understanding. This can be a tricky given that there are countless currents passing through our stream of consciousness. The only way to stay on top of them is by acquiring simplicity. Simplifying not only pertains to cognition, but also to our values, lifestyle and possessions. Most of us have been conditioned to believe that having more stuff leads to prosperity. We chase after the material by investing long hours in work, juggling complicated schedules and lengthy to-do lists. We get caught up in making a living, instead of making a life. We try to satiate ourselves with sensory pleasures hoping that it will bring us closer to a state of peace. But true and lasting happiness isn’t a result of accumulating more. It comes from removal and not hoarding. 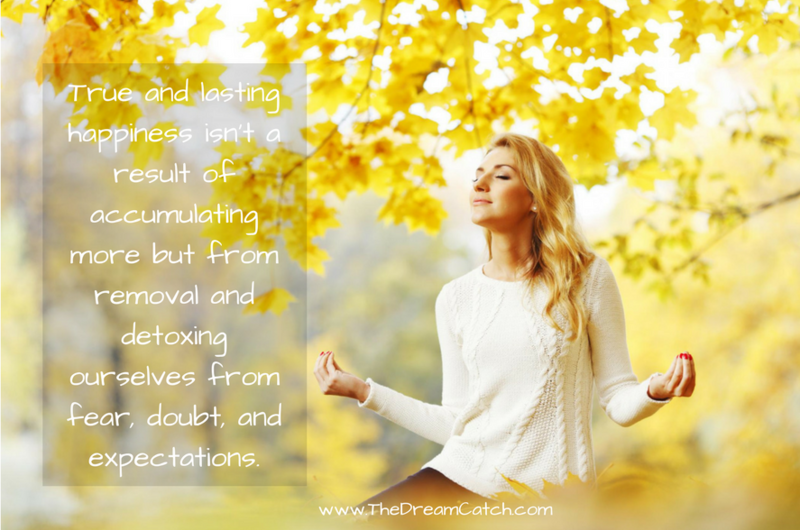 It comes to us when we detox ourselves from fear, doubt, and expectations. Below that lies an haven defined by purity, where joy exists in its most essential state. Once we snap out of the hypnotic spell of ‘having more’ and shift our perspective, we’ll see that in the end, less is always more. If we trust and we avoid being defined by the ladder of success, prosperity can enter our lives, not as worldly gain but as lasting serenity. 1. Simplify your surroundings: Adopting simplicity starts with your immediate surroundings. Look around you and see if there’s anything that you can do to reduce clutter in your home such as stacks of magazines, books, paperwork and clothes. Clean up and organize your surroundings so that there are fewer distractions. Aim for quality over quantity and stop yourself from accumulating things that’ll bog you down and hinder your freedom. The simple act of keeping a clean and tidy living space will make you feel lighter and less scattered. Aim to live lightly and refrain from the temptation of buying things you don’t need. 2. Clear your mind space: Clearing out your inner space is just as important, if not more, than clearing your outside space. Step out of your mind and examine your thoughts objectively. Work towards eliminating any worrisome or negative thoughts that are causing you stress and undue anxiety. Cultivate a daily practice of meditation where you can slip into the silent space between your thoughts and get into a state of no-thought. In this calm, focused and centered space, you can transcend neurotic thought patterns and replace them with positive emotions such as peace, bliss and joy. Focus on your breath and be in the present as you engage in this contemplative practice. 3. Become a genuine and authentic communicator: Complicated relationships are something to avoid if you intend to live a simple life. You can evade this psychological warfare by following the first agreement in Don Miguel Ruiz’s book The Four Agreements, which is to “be impeccable with your word”. This simply means that whenever you interact with others, you should endeavor to speak with integrity and only say what you mean. Avoid gossip and using your words to hurt or vilify others. Communicating positively will harmonize your emotions, thoughts and actions and will anchor you in your personal truth. Lying and mind games are tedious and add psychic weight. It’s much better to be honest and straightforward, even if it requires you to have tough conversations. When you speak with others, make sure that you precisely communicate the essence of what you intend, speak simply, and don’t burden your listeners and with rote and redundant details. 4. Stick with the basics: Stripped down to the basics, there are few things that humans actually need to survive. We all need food, water, shelter and community. Everything else is superfluous. That new iPhone or that Prada bag might tantalize our fancy, but we need to stop and ask ourselves if it’s something that will truly fulfill us. If we strip away all the social expectations and media messages we realize that these things won’t make us happy. What we really need are the simple and intangible gems of life. Joy is found in simplifying our desires and sticking with the basics. 5. Maintain balance: Your lifestyle and your self-care routine have a significant impact on the biochemistry of your body. An unhealthy lifestyle and disorganized routine will leave you feeling frazzled and incapable of adopting simplicity in your thoughts. By creating structure and prioritizing your tasks, you’ll be better able to focus your energy and efforts on what really needs to get done. As efficiency expert, Tim Ferris says, “being busy is a form of laziness – lazy thinking and indiscriminate action.” You also want to simplify your diet and exercise. Stick with the basics like consuming more fresh food, getting enough rest and exercising daily. Maintaining a state of balance in your physical health is conducive to accessing a state of inner peace and strength. Adopting simplicity is like peeling the multiple skin layers of an onion. As we gradually remove the superficial layers of our persona, we’ll eventually get to our core, defined by the sacred aspect of our being – our soul. We’ll discover that simplicity is the quintessence of our soul and that it offers a direct pathway to a higher state of consciousness. 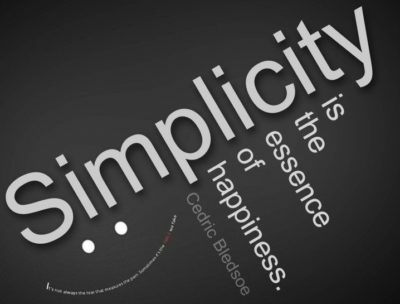 Question for you: Do you believe that simplicity is the key to happiness? 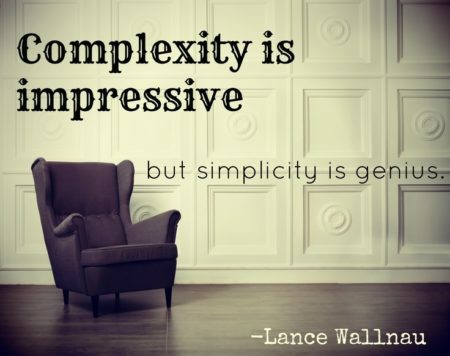 How have you tried to adopt simplicity in your life? Seline Great piece of writing, I believe we make life complicated because we want to fit with the crowd. And the crowd is hectic, uncontrollable and difficult to keep up. That is why the human being which knows that life is simple chooses rather to make it complicated because of its need to belong. Be comfortable with your own self and you’ll see how simple being alive is. I totally agree with you Ricardo. Thanks for adding your 2 cents! The article is interesting and useful. I tried it and found it really useful. Thank you very much for all that you do.